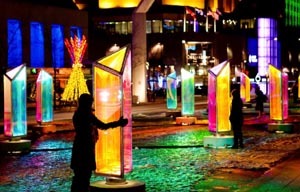 Seaport is transformed into a colorful winter wonderland with 25 Prismatica pillars along the boulevard. Located along Seaport Boulevard, this installation is free and open to the public daily while on exhibit in the district. We are keeping the neighborhood bright all winter long!